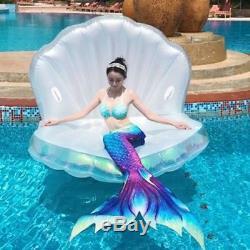 AprilDecember666 2018 New Swimming Pool Giant Shell Inflatable Float, Mermaid Sea Shell Pool Raft Mattress, Pearl Scallops Floating, 67 x 47 x 47 inches - White (Iridescent Edges). 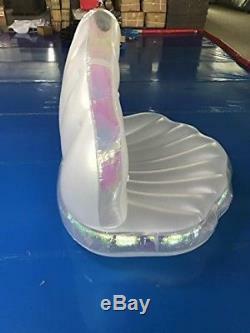 Lay back and enjoy a sunny day out on the beach or by the pool on the inflatable Colossal Pearl white Clamshell Mermaid Floatie. 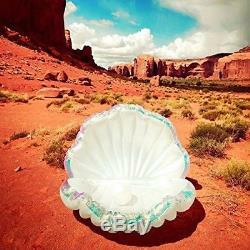 MATERIAL: This Luxurious Pearl Shell Float Is Not Only Huge, But It Is Made From Extra Thick Durable Vinyl , Environment protecting, Non-toxic. The product surface is smooth, easy to clean. LUXURIOUSLY SIZED FOR TWO: Inflation size: 67x47x47 inch(170x120x120cm). The float is large enough for you and your special someone to sit on comfortably, without having to wet yourself in the water. The recessed seating is comfortable for lounging, reading and talking. The 2 built-in handles give passengers plenty of stability and support. Need to inflate it by yourself with the help of inflator. Application: Cute Summer Swimming Toy, super colorful and beautiful. For Outdoor, Beach and Pool Party such as pool, lake, seaside and so on. Descriptions: -PERFECT SUMMER GIFT: Great gift to surprise the kids or girlfriends, to be the center of pool parties etc. Travel, honeymoon can take it, it will give you a perfect trip. Easy to pack and a must have for any vacation destination and pool parties. Enjoying a day out on the beach or by the pool? Dont leave your inflatable Clamshell raft behind! Simply pack it in the car and you are ready to go! It will be the gem at your next beach vacation and make you stand out in any crowd! -Two adults could easily sit on this although. I think children would probably enjoy it more. Recommended for users ages 6 and up with adult supervision for children. Specifics: Inflation Dimensions : Inflation size: 67x47x47 inch (170x120x120cm) Size might be slightly different due to the gas saturation and measurements. PVC Thickness: 0.25mm--0.30mm Weight: 8.8 pounds Material: Durable High density nontoxic vinyl plastic Package includes: 1 PVC Shell Float, 1 Pearl Beach Ball WARNING: PLEASE DO NOT USE KNIVES TO OPEN PACKAGE TO AVOID PRODUCT DAMAGE WARNING: THIS IS NOT A LIFE SAVING DEVICE. DO NOT LEAVE CHILDREN UNATTENDED WHILE IN USE. THIS ITEM IS ONLY TO BE USED IN WATER IN WHICH THE CHILD IS WHITHIN ITS DEPTH AND UNDER ADULT SUPERVISION. Notice: This product is PVC inflatable products, when using, remember to pay attention to the following items: 1. Don't for a long time in the sun 2. This product is inflatable , should not be used in the sharp, high temperature, corrosive sites. Do not use it as a lifesaving device. Stay away from fire or hot items. Air requirements: Please do not inflatable overabundant. Customer service is our top priority! Please be sure to read the description thoroughly to make sure that this is the item you want before making a purchasing decision. We make every effort possible to accurately describe and depict the items. Please be aware that slight variations in color may be due to differences in lighting and computer monitor resolutions. Thank you for shopping with us. If ordering electrical items outside of the U. Please note that they will come equipped with a standard U. You will need a suitable adapter to use the item in your country. An adult signature will be required. Please be sure to have available help on hand to assist you with moving the item to the desired location in or outside of your home. Only factory defects are accepted as a reason for a return. In the case of factory defects, if available, we will replace the product for you. When returning an item, it must be in all of the original packaging and include all of the original accessories or items that came with it. The item and package should be in original and perfect condition. We do our best to process as quickly as possible. Orders are processed immediately and dispatched to fulfillment as soon as they are received. For this reason, we are typically unable to honor cancellation requests. If the order has gone too far through the fulfillment process, we will be unable to cancel. Listed by Sku Grid Listed. 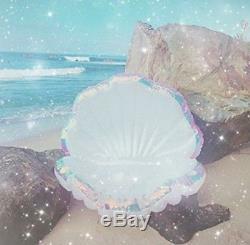 The item "AprilDecember666 2018 New Swimming Pool Giant Shell Inflatable Float, Mermaid X" is in sale since Tuesday, June 19, 2018. This item is in the category "Home & Garden\Yard, Garden & Outdoor Living\Pools & Spas\Pool Fun\Floats & Rafts". 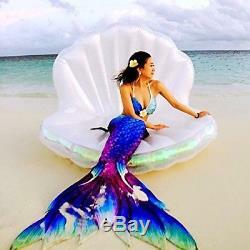 The seller is "first_stop_to_shop" and is located in US.